We offer both types of liners. 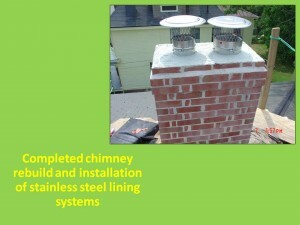 Stainless steel liners are often a good choice for the furnace or boilers flues. A cast in-place liner is a slurry mix of a special formulated masonry product. The mix flows into the nooks and crannies and adds a tremendous amount of structural integrity to the chimney. 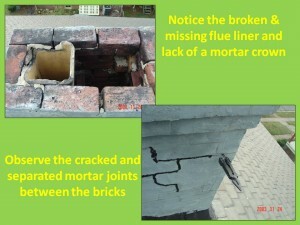 Removal of the old lining system being made of a vitreous clay tile or terra cotta liner is needed. Cast in-place liners are typical installed in various sizes, but only two shapes either round or oval. We use the flue ratios in accordance to the International Residential Code for sizing fireplace flues and the National Gas Code for sizing heating appliances.